Bhimas Deluxe Hotel is an extremely convenient place to relax in-between the devotional journeys. 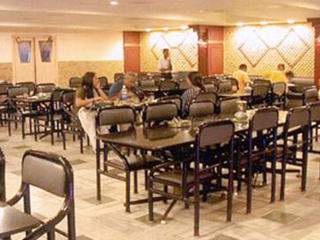 It is located right next to the railway station of Tirupati, making it very convenient to all travellers. The Hotels offers its guests luxury and comforts, making them feel home away from home. Doctor on Call, Travel Counter, Complimentary Newspapers in Lobby, Conference Hall, Security Guard, Currency Exchange, Business Facilities, Airport Transportation, Laundry Facilities, Restaurant. Iron/Ironing Board, Air Conditioning Room, Cable/Satellite TV, H/C Water, DVD Player, House Keeping, Toothbrush/Razor on Request, Wakeup Calls, Attached Bathroom. Parking, Laundry Facilities, Doctor on Call, Conference Hall, Business Facilities, Breakfast Services, Restaurant, Room Service. User reviews for "Bhimas Deluxe Hotel Tirupati"